About meGraduated from the University of Michigan's School of Information where I completed both the Library & Information Services and the Archives & Records Management specializations. After a brief, but wonderful stint on a grant project at the Benson Ford Research Center, I'm currently working just about as close as you can get to my dream job. Go me. My profile pic is a t-shirt design by Jeph Jacques, creator of the delightful web-comic Questionable Content. Thanks Jeph, you're awesome. 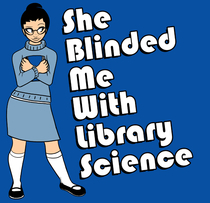 Oh, and I'm pretty much addicted to LibraryThing. Yup, pretty much. Check out what I'm Currently Reading (or have recently finished reading, but haven't written a review for yet). If you wanna know, just ask me. My ratings may seem a little generous since I've not rated many books lower than 3 stars. Remember, however, most of these are books that I actually own. Books I don't like (or that I no longer find useful) will eventually be donated or sold.